Why you should never buy pre-prepared Grocery store food !!!!! Well, STAY AWAY, keep that off your family's table if at all possible !!!!!!!!! Why? Well let us start with the FACT the grocery store is not selling you this to make your life easier they are selling you this to make more money. Wait, they are selling this cooked item at a price that is equal to or less than the uncooked product and you say they are doing it to make money....... how? Grocery stores must NOT sell meat to you that is past its expiration date. They often mark down ground beef, chickens, even steaks. You know the meat with the YELLOW mark down stickers on them at the meat counter !!!!!!! Well, what happens if that meat expires? YEP, YOU GUESSED IT..... they take it off the shelf, remove it from its packaging and cook it. When you buy that rotisserie chicken, that meatloaf, that roast that has been cooked in the grocery store, it is just old meat that did not sell in the meat counter. The grocery store industry has run the math and calculated it is more profitable to sell old meat to you as a cooked product than discard it. 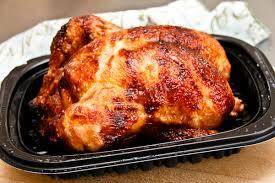 So, STAY AWAY from cooked meats in a grocery store they are out of date products repurposed to increase profits. EAT SAFE, BE WELL and REMEMBER if a Grocery Store has a Health Food aisle, what is everything else in the store?